Matthew, who, at 24, will be the youngest driver in the Pro-Am field, competed in the 2016 Indianapolis 500. He attracted the attention of top IndyCar teams when he dominated the 2013 Pro Mazda Championship with 13 race wins and two other podiums out of 16 rounds. That performance was a tremendous follow-up to 2012, when he captured the U.S. F2000 National Championship, edging Spencer Pigot by seven points. 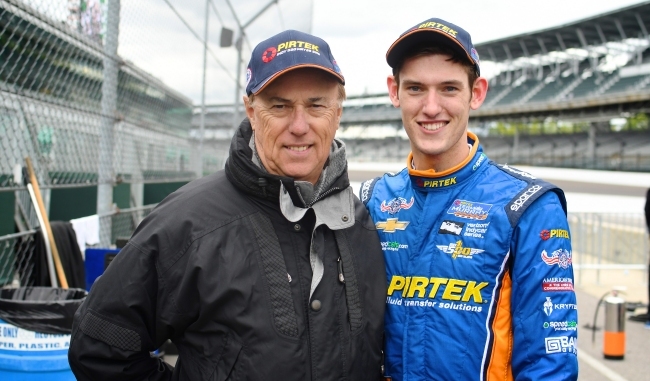 Brabham ran a full season of Indy Lights in 2014, winning the series’ marquee event, the Freedom 100, at IMS. In recent years he has competed in the Speed Energy Formula Off-Road and Virgin Australia Supercars championships. Some of the other top names who will be lining up at the famous yard of bricks include Al Unser, Jr., Bill Elliott, Paul Tracy, Willy T. Ribbs, and Davey Hamilton. Sarah Fisher, the defending champion of the A Production class, and Max Papis, who won B Production last year, are also looking to drink more milk. Three-time Indianapolis 500 champions Johnny Rutherford and Bobby Unser will oversee the entire weekend as Grand Marshal and Honorary Chief Steward. The Indy Legends Pro-Am is the Saturday feature event of the Brickyard Invitational. The Indianapolis 500 veterans will be in 1963 to 1972 vintage Corvettes, Camaros and Mustangs of SVRA “Group 6” A and B Production. The professionals will be paired with amateur drivers, splitting their stints at the wheel. The charity event will benefit IGNITE – the Autism Society of North Carolina’s community center for young adults with high-functioning autism or Asperger’s syndrome. IGNITE was founded by The Evernham Family Racing for a Reason Foundation – a nonprofit established by legendary NASCAR crew chief Ray Evernham and his family. In addition to the Pro-Am, there will be a festival of other activities at the Brickyard Invitational including the Sunday, June 17 feature race by the professional Trans Am series headed by 2017 champion and emerging superstar, 20-year-old Ernie Francis Jr. The weekend also presents the Hagerty Insurance “shine and show” car corral, vintage motorcycle racing, and 500+ vintage racers ranging over 100 years of automotive history racing in SVRA Groups 1 through 12. An oval exhibition featuring the iconic 1950’s roadsters will close the day on both Saturday and Sunday. Also, the Pre-1920 Race Exhibition Series cars will be on track along with a paddock area full of in-period equipment displays. Former Indy 500 Rookie-of-the-Year Lyn St. James will be among the drivers of those cars.